In this powerful book Esther Hicks has taken the concept of each person creating their own reality to an entirely new level. Esther Hicks and the teachings of Abraham explain how one creates their own reality and then provides techniques one can employ to manifest what a person wants in life. If you haven’t yet read any of Esther Hick’s books, the “teachings of Abraham” can be difficult to understand and buy into initially. According to Esther Hicks, she and her husband Jerry, were chosen by spiritually advanced beings (who call themselves Abraham) to relay information to spiritual seekers. Esther Hicks’ lack of resistance allows her to be the mouthpiece for the information that Abraham provides. Be happy and you’ll get what you want are the core teaching of Abraham. 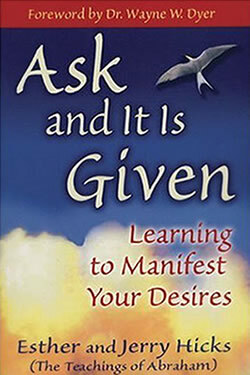 “Ask and It Is Given” explains in detail how to get happy and stay there long enough to manifest your own desires. The following is a summary of the concepts in the book. We are all energetic beings creating the reality we are living based on what we focus upon. Whether good or bad, if you focus your attention onto anything the universal law of attraction will bring it into your physical experience eventually. There are three points to the creation of your own reality. Step one is the asking, which is done every time a person puts forth a new desire. Step two is handled by the universe (or the source or God) in the immediate answering of that desire. Step three is the receiving of the desire, which is up to the individual and where the vast majority of people fail. The receiving of a desire can only happen when a person’s energetic system matches the energetic vibration of their desire. In other words, raise your energetic vibration and get what you want in life. This raising of a person’s vibration is done through releasing of resistance in their energetic system. A person is only able to release a certain amount of resistance based on where their system is currently vibrating (called their emotional set point). By understanding one’s own emotional set point, at any point in time, one can move systematically up the energetic ladder. When a person has raised the vibration in their energetic system to a high enough level, the resistance to their desires is removed and the realty they want flows into their experience. The second half of the book “Ask and It Is Given” is spent explaining the techniques one can employ to release the resistance in their system based on their current emotional set point. This is where the book shines and is truly revolutionary as tool for anyone wishing to advance spiritually. An initial exposure to the concepts put forth by Esther Hicks might lead one to think she is solely concerned with people getting what they want out of life. Admittedly this was my impression when first learning of Abraham while watching the movie “The Secret”. My theory is that these teaching put forth under the name of Abraham are subtly designed to help a soul progress spiritually. Like the writings of Eckart Tolle, the books by Esther Hicks introduce concepts that evolve a person spiritually. The concepts are purposely presented in a way that doesn’t directly conflict with the religious dogma so many of us have incorporated into our personal belief systems. Hopefully you’ll be open enough to allow yourself the opportunity to study the teachings of Abraham. Let you intuition be your guide and you’ll probably find the wonderful benefits of utilizing the information that Esther Hicks talks and writes about.